A science museum exhibit gets a brush up at the dental school. 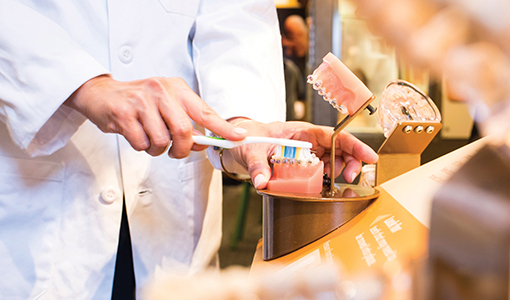 When several sets of teeth from display models at Boston’s Museum of Science needed restorative work, a professor and postgraduate student from the School of Dental Medicine brought them to One Kneeland Street and repaired them so they’re less likely to need future work. The teeth are part of the dental exhibit at the museum’s Hall of Human Life, an interactive area where visitors can learn all sorts of things about their own bodies, such as how many calories they burn as they walk or how good their balance is. The orthodontics display is particularly popular—perhaps because many of the thousands of visitors who come to the hall each year are of prime braces-wearing age—so the exhibit teeth were the worse for wear. The museum turned to Melissa Ing, D89, an associate professor of comprehensive care, and Paul Shamirian, D16, DG18, a resident in orthodontics. Ing has been involved in volunteer projects at the museum since her dental school days and most recently organized some of the summer camp sessions for kids, including one on dental forensics and a “Mini Medical School” on dentistry. Part of the reason the exhibit models’ teeth were in such bad shape, the Tufts dentists discovered, was that the braces on them used real orthodontic wires, which have some elasticity to coax teeth into an arch during treatment. Unlike teeth in a human patient, Shamirian said, the teeth on plastic models don’t move, so the wires kept pulling off the brackets of the braces. He solved the problem by using techniques he learned at Tufts to design a wire that is rigid. Finding ways to depict the inner workings of the human body in an accessible, interactive way is one focus of the Hall of Human Life, said the exhibit’s manager, Elizabeth Kong, a graduate of Tufts’ Sackler School of Graduate Biomedical Sciences. For example, she noted, the models themselves are of adult-size mouths, rather than child-size, for better viewing. Shamirian “got to experience what our exhibit designers go through,” she said. At this Boston elementary school, cleanings, fluoride and fillings are available just down the hall. Every dentist can learn to put the anxious and the fearful at ease. It’s not magic; it simply takes time and effort. Mina Kaddis, D06, was content in his private practice. Then his bishop had a request. First job? Buying a practice? Need an associate? Let Tufts play matchmaker. An experimental drug that mimics an insulin-regulating hormone could rebuild bone, and perhaps advance treatment for Type 2 diabetics. Look up! That’s the new directive in the dental clinic that treats Tufts’ youngest patients.